Fly Casino has Dirty Dancing! Based on the hit 1980’s film which starred Jennifer Grey and Patrick Swayze, you get to marvel in the dancing and sounds of the 60’s. This new 5-reel game at Fly Casino has hree randomly triggered features during the base game, which is always so much fun and two progressive jackpots! The Mambo Free Games feature allows you to spin the wheel to win extra free spins, a 2X multiplier and Dancing Wilds which appear on each free spin. Whirling Wilds feature where up to 6 wilds are added to the reels. 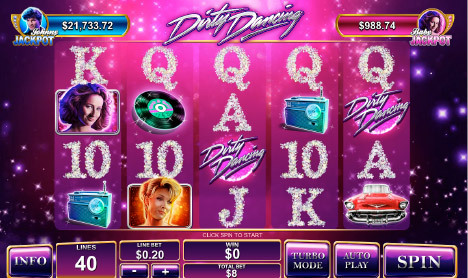 Dirty Dancing Bonus feature where you pick boxes to win cash prizes and items – reach the last stage to enter the jackpot game and win 1 of 2 progressive jackpots. 130% Bonus up to 130.00! On Sunday from 00:00GMT until 23:59 GMT, all members will receive a 130% bonus up to 130.00 on your deposits of $/£/€30 or more. Super $300’s. From 00:00GMT until 23:59 GMT, all members on their deposit of just $/£/€30 or more will receive a 100% bonus up to $/£/€300.00. 166% Big Money Tuesday! From 00:00GMT until 23:59 GMT, all members are invited to receive a 166% bonus up to $/£/€166.00 on your deposit of just $/£/€30 or more or more.